Structure of Thought, by Mike Starn and Doug Starn. For many years, advancement in biological psychiatry involved innovations in molecular biochemistry and biophysics. We learned which substances potentiated which cellular events, and mapped unfathomably complex chains of reaction. We began to understand transporter theory and to trace episodes so quick that they seemed to defy our notions about time. We digitized consciousness into neural components, and specified the electrical impulses and chemical interactions involved in every process from aggression to love to the formation of memories. On the basis of these insights, new compounds were designed to treat a variety of previously intractable mental and neurological illnesses. Their novel mechanisms of action were somewhat meanly represented by formulae and theories and abbreviations and equations. What we understood surpassed our abilities to description. In the past decade, that has changed. Many of the most important developments in brain science have been in imaging. With the emergence of MRI and other advanced technologies, we have begun to chart what is happening deep and fast, things we couldn’t see with any previous methods, and this visual capacity is allowing us a fluid mastery previously inconceivable. The word “imaging” suggests photography, but in fact what an imaging mechanism provides is a great accrual of numbers, which computers put together to make visual symbols of neural activity. The image is the humanization of information too vast to absorb otherwise: if a picture is worth a thousand words, it is worth a hundred thousand numbers. With imaging, what was abstract becomes palpable; what we comprehend visually is more convincing to us than numeric sequences. Suddenly, we are looking into the brain itself while it is alive and active. Jules Verne never proposed anything more thrilling and unlikely. We can take someone’s consciousness, previously a philosophical problem, and describe what it looks like; we can subtype illnesses because we can see the difference between one and the next before we even begin noting symptoms. Our wildest expectations of outer space have never brought us more startling, informative, weird pictures than these graphic translations of magnetism and mathematics. Black Pulse, by Mike Starn and Doug Starn. Mike and Doug Starn have always made work that looks deep inside their subjects and addresses the status of the image both as representation of fact and as fact itself. Their photographs are not shorthand for numbers, but they are just as full of information as brain scans, vivid and explicit manifestations of the intersections between reality and ideas. Their early distressed images reflect the transience of photographic truth, which documents a reality already long gone when a print is made. This material contemplates the history of the image as well as of the subject. In more recent pictures, they have explicitly studies light, the medium and message of all photography. In some pieces (Attracted to Light, figure 3), they examine the interaction between light and desire: moths flit towards a glow, their powdery wings refracting the brightness for the sake of which they so often give their lives. 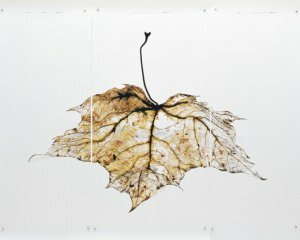 The Starns’ newest body of work (Structure of Thought, figure 1) uses trees to express the relationship between the light that makes photographic prints and the translation of that light into life through the process of photosynthesis. In some sense, the tree is light made flesh, much as the brain scan is math made image. The physical resemblance between these depictions of trees and leaves and portrayals of the seemingly infinite branching of dendrites is striking, but the deeper parallel lies in the fact, rather than the appearance, of a functional complexity. The tree photos are not x-rays; what they show is out there to be seen by anyone. Yet they take on a diagrammatic quality and seem to elucidate the structural architecture of plants. They remind us how natural order often looks, at first glance, like chaos. The essence of the trees is a system of distribution, in which the massive trunk relies on the branches, which in turn depend on leaves; there is symbiosis between the singular and the multiple. This process is akin in some ways to the process of cell division on which life is predicated, and, equally, to the relationship between a photographic negative and the many generations of prints that can be made from it. As we look at the Starns’ trees, we recognize how the strength of the core relies on the constant fine division of the component parts. The leaf series (Black Pulse, figure 2) is a logical extension of the tree series: the multitudinous veins of the leaf are yet further refinements of the capillaries represented by the Rapunzel cascade of the branches. The series limns the innumerable divisions by which living things survive, demonstrating how the endless branching that we can see becomes an endless branching of what we cannot. It is as though this were a family tree – the trunk a great patriarch, the branches sons and daughters, the leaves all full of cousins.